(Read the first part of the article here). During the experiments in the framework of Hawthorne studies, the employees demonstrated a stable rise of productivity in those groups, where there was a good contact established between them and their supervisor. As soon as the members of experimental group started receiving attention and encouragement from their boss, they recognized themselves as individuals, as important people, not just “somebody” working at production lines. Correspondently, in those groups, where supervisor did not demonstrate friendly attitude and was sever to the workers, output and efficiency were notably smaller. During the experiments there were numerous other researching activities, like interviewing the personnel, carrying out work observation tests, etc. The most successful were sessions of personnel counseling, when a qualified management consultant was discussing work related problems with the employees, consulting them and giving professional advise how to make the work more pleasant. These experiments and researches resulted in significant growth of productivity at Hawthorne Plant, improved all economic indexes, helped to create perfect working environment and received lots of positive reaction from all the employees and administration of the factory. That is why the Studies, which had been supposed to last one year, have been conducting for more than 5 years. Detailed results of Hawthorne Studies were publicized as a 600-pages book written by a professor from Harvard School of Business Administration and two senior administrators of Western Electric Company’s Hawthorne Plant. In this work the most important conclusion is stated as the following idea: all the improvements, which were demonstrated by the experimental group during the Studies, can be understood through the influence of social system on every individual member of the group. In other words, all the improvements in workers’ performance and productivity must be explained from social positions, not by changes in particular intensity of lightening or shortening of working shift duration. The Studies showed that every workplace must be taken as a complicated social system, which consists of unique characteristics of every personality. That is how the authors comment on such a conclusion: “The work activities of this group, together with their satisfactions and dissatisfactions, had to be viewed as manifestations of a complex pattern of interrelations.” (from “The Hawthorne Effect and Its Relationship to Stuttering.” John Harrison). But, probably, the most important finding of the Studies was the fact that productivity of any working group can be influenced and improved by manipulating with physical, social or psychological characteristics of working environment. It means that any administrator can use a number of hidden indirect controls and methods to improve the response of his subordinates and increase the productivity of the group or organization, using above mentioned environmental variations. The Studies also demonstrated that the impact of exactly social demands of the employees, both inside and outside of the working group, appeared to be much more important than any material requirements of working environment. For example, it became obvious from the interviews and consultations that it was much more important for the employees to feel respected, appreciated, valued and to be secure at their workplaces, than to be provided with some modern equipment, machinery or developed technology for physical part of their work. Hawthorne Studies received the best application in developing Human Resource Management theories of evaluating intervention effectiveness. These researches specified instruments and sketched the schemes of stimulating of productivity of the employees, gave some hints about the opportunities of improving efficiency of the personnel, and underlines importance of social factor for achieving good results in organizational operation. It was proved experimentally that such characteristics, like excessive informality in the group of employees or establishing steady fixed norms of output, usually affect productivity. Adobe’s Insight platform is a dynamic internet analytics tool that, when used properly, can be an instrumental component of successful online marketing and sales plans. Adobe offers two certification exams for IT professionals to demonstrate their expertise with Insight. The first is a Adobe certification exam designed specifically for IT analysts who utilize Insight to plan, monitor, and collect and evaluate data through Adobe Insight. The second certification exam for this specific product is the Adobe Insight Architect exam, which is targeted to validate the skills and abilities of designers that build analytics using the Insight platform. Both the Insight Architect and the Insight Analyst exams are often sponsored by employers as professional development initiatives for their staff. Web marketing activities are an increasingly important part of any effective sales and marketing campaign. Notably, as these exams are fairly new to the Adobe certification program, candidates are required to complete a formal Insight training course in their focus area before taking their Adobe certification exam. Exams are offered only at the end of the formal training class; however, testing candidates are still encouraged to practice their skills and build their knowledge with tutorials and practice exams such as those offered by exam prep services like TestsLive.com before sitting for the Adobe certification exam for architects and/or analysts. The Hawthorne Effect is a well-known behavioral phenomenon, which was firstly observed and researched during so called Hawthorn studies. In its most general meaning Hawthorne effect is a theory that explains changes of the response of an experimental group members during the research, which takes source from awareness of such group members about their being under experiment (attention). In other words, when a person knows that he or she is supervised, the results of his/her output change; as a rule, the output increases or improves. Nowadays Hawthorne effect has become an instrument of great generality, and in our times it is extensively used for helping people change, become more organized and disciplined, learn being more productive, and even get rid of bad habits like being always late. It became a fundamental point of one popular management theory, which says that any change in surrounding environment of an employee results in increase of his productivity or efficiency. Hawthorne effect must be taken into consideration when conducting practical researches, for example, different behavioral, sociological and psychological experiments, medical tests, or marketing researches, etc. Hawthorne effect takes source from a series of experiments known as Hawthorne Studies, which were carried out from 1927 till 1933 at Hawthorn factory of Western Electronic Company located in Illinois. At those times, Hawthorn plant was one of the most productive and advanced production lines, where about 29,000 people were employed. 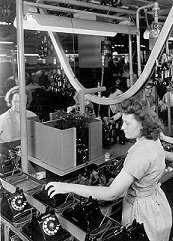 The main products of Hawthorne factory included telephones, wires, cables, relays and a great variety of other telecommunication facilities. A series of researches studying the effect of working environment on productivity at Hawthorne factory were conducted by a group of specialists from Harvard Business School. Professor Elton Mayo, together with his assistants F.J. Roethlisberger and William J. Dickson, were the leaders of the research group. Further researches moved to manipulating with a number of psychological variables of working environment, at that leaving the working part with no change. For example, the employees were offered to have very small 5-minute breaks every 30 minutes of their working shift, then 10-minutes breaks, and then 15-minute breaks. The researchers could not help noticing the fact that every single change or a new part of the experiment caused a new rise of productivity of the participants. Launching a piecework payment system also brought to increases in the amounts produced, because the employees could easily see their own rate and progress. Then the research group continued experiments based on changing other variations: for example, shortening the duration of working shifts, making modifications in workday assignments, making the work of the employees easier and easier, etc. All these experiments brought the research team to the conclusion that it was not the change of an environmental variable (physical or psychological), which resulted in steady increase of productivity. It became obvious that such increases took source from the very fact of changing something. So, the employees felt attention focused on themselves; they felt themselves to be important and central in this research, that is why every time they were trying harder and harder to spend as much efforts as they could. Experimental Hawthorne studies also helped to find out the importance of social variables when estimating productivity. Initially an experimental group of six female employees had to work in private separated workplaces, and then all the employees were moved into one big hall. As it was easier for them to communicate and socialize with one another in a shared room, their productivity started considerably decreasing.